Two small depressions on Mars found to be rich in minerals that formed by water could have been places for life relatively recently in the planet’s history, according to a new paper in the journal Geology. Smectites are a specific type of clay mineral that readily expands and contracts with adsorbed water. They contain Silica, plus Aluminum, Iron or Magnesium in their structures. They form by the alteration of other silicate minerals in the presence of non-acidic water. Weitz and her co-authors studied approximately 300 meters of vertically exposed layered rocks within two 30 to 40 kilometer depressions, called troughs, near the western end of the Valles Marineris canyon system. Using high-resolution images from the High Resolution Imaging Science Experiment (HiRISE) camera and hyperspectral data from the Compact Reconnaissance Imaging Spectrometer for Mars (CRISM) on the Mars Reconnaissance Orbiter (MRO) spacecraft, combined with Digital Terrain Models (DTMs) to determine elevations and view geometric relationships between units, the team was able to map hydrated minerals and understand how the water chemistry varied with time within each trough, said Weitz, a HiRISE team member. Each trough probably experienced multiple episodes where water partially filled in low-lying regions and deposited minerals. As each trough continued to enlarge and experience collapse over time, older minerals became buried and separated, followed by deposition of younger minerals, then finally erosion to re-expose buried units. 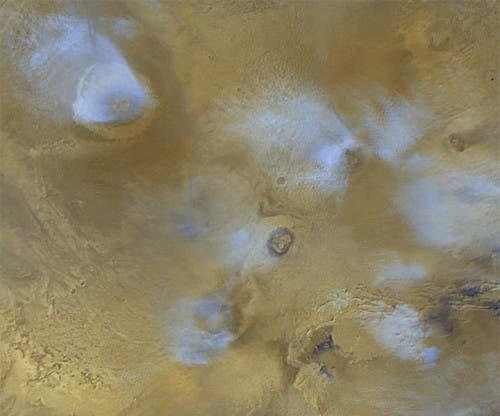 Volcanism from the Tharsis volcanoes to the west (image above) may have created subsurface water that was subsequently transported through the ground and into the troughs. Localized volcanism that produced ash and gases, hydrothermal activity, and melting snow/ice within the troughs could have also produced some of the minerals. The observed minerals indicate water varied in pH levels over time, in one trough from acidic to neutral, and in the other trough from neutral to acidic and back to neutral. Other occurrences of Fe/Mg-smectites have been found on Mars but almost exclusively in association with older, Noachian-age (more than 3.6 billion years ago) rocks, or produced by younger impact events. Following the deposition of Fe/Mg-smectites in the Noachian period, the climate on Mars is believed to have changed during the Hesperian time to favor formation of minerals under more acidic conditions, such as salts rich in sulfur (sulfates). “These clays formed from persistent water in neutral to basic conditions around 2 to 3 billion years ago, indicating these two troughs are unique and could have been a more habitable region on Mars at a time when drier conditions dominated the surface,” said co-author and CRISM team member Janice Bishop from the SETI Institute and NASA AMES Research Center. "These troughs would be fantastic places to send a rover, but unfortunately the rugged terrain makes it unsafe both for landing and for driving,” Weitz said. The study was funded by grants to PSI from NASA, the Jet Propulsion Laboratory and the University of Arizona.